Starting in the mid 1950s (alongside her brother and sister Marie, also later a choreographer), Edwina began a career as a background dancer and extra which lasted until her emigration from India in 1967. Tall and strikingly beautiful, she is easy to pick out of a crowd (and she rocks a tiara, too). She remembers her days in cinema fondly, where she was part of a tight-knit group of dancers which included Herman Benjamin, Oscar Unger and Vijay (all of whom carved out careers as choreographers, and the first two of whom have come in for their share of conversation on this blog). Edwina says that she didn’t think much about it all; she was just earning a living and never thought that what she did was that important. Of course I disagree wholeheartedly: what would these songs be without the backup dancers and band members who so enliven them? Her life in those days is one I think many people would covet—I do, anyway! [Mumtaz] and I got on quite well. Also Mala Sinha and Shakila and Tunuja were very down to earth especially with me. 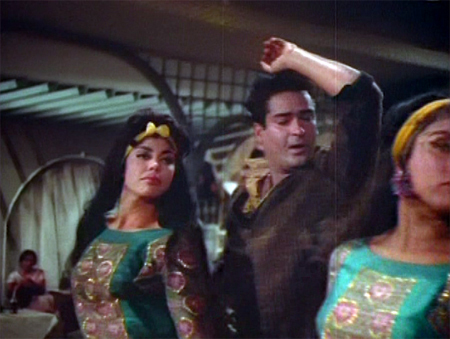 I used to go to Mala Sinha’s home to teach her to dance when any dance was set on [us] by request from her. Her parents too were so sweet and polite. They were from Nepal. Edwina can be seen in so many really popular songs that I can’t possibly name them all (and am finding new ones all the time), but these are a few that I think showcase her distinctive talent. 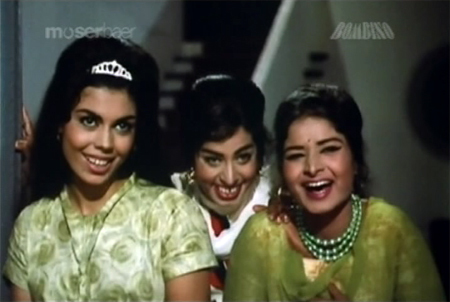 She is in Arzoo (1965) with good friend Teresa (also a dancer). Edwina hates this screencap but I love it, especially the dress and the little gold bow in her hair! 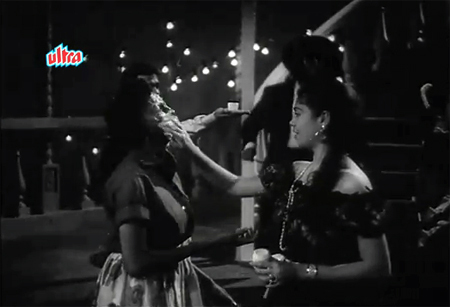 She has a small role as one of Sadhana’s schoolmates and features prominently in this fantastic song (she is wearing the same dress). This song is a favorite of mine for the good-natured competition between the music and dance styles it contains. She and her siblings worked a lot with my beloved Shammi. In fact you can see her and Ted and their sister Marie plus assorted in-laws and friends (and choreographer Saroj Khan) in the great “Suku Suku” from Junglee. Edwina is easy to find in songs from (but not limited to I am sure) Vallah Kya Baat Hai, Singapore, Dil Deke Dekho, Chinatown, and Teesri Manzil. I am not at all envious of her, no, not at all. She is also the girl—the zulfonwali!—who shakes her lovely hair right into the camera at the beginning of the song “O Haseena Zulfonwali”. Well, it is impossible not to be, really. 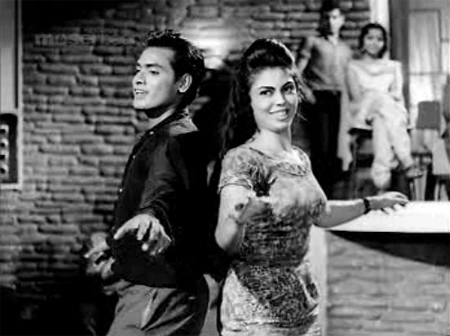 Another great Helen song that Edwina is part of is the crazed “Tiki Riki Tiki Riki” from Woh Kaun Thi, where she is the first dancer onscreen, partnered by Oscar—himself the very first background dancer I ever took notice of (I called him Pompadour Man). 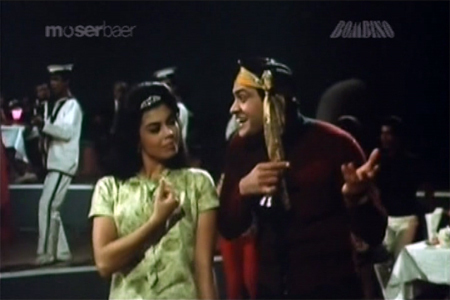 Edwina (in a black dress) dances with Mehmood in this hilarious face cream ad from Shriman Satyawadi (1960). One of her fondest memories is of being in Cha Cha Cha (a relatively dull story made wonderful by the ad hoc twisting and cha-cha-cha-ing of Helen, Bela Bose, and Edu and her colleagues). 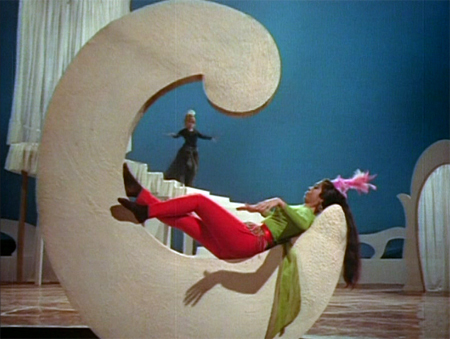 Her name appears in the credits, and she is half of one of the two final dance pairs in the Cha Cha Cha Dance Competition near the end of the film. She had just had her second baby (of four, all very good-looking people now themselves) two months earlier, but you can’t tell! And many thanks to Tom for putting this up online so we can all share in the Goodness of it—you’ll see Oscar there too, along with a very young Aruna Irani and Macmohan. Madan Puri even says Edwina’s name! 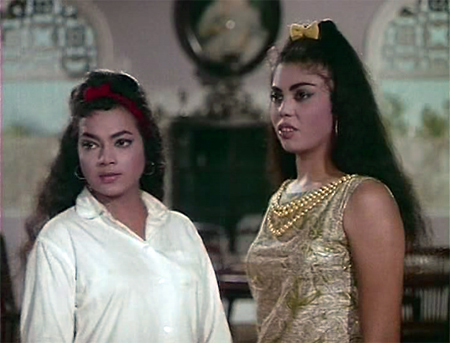 One of her last appearances (she tells me she was beginning to attract more notice in the industry just as she decided to leave India for good) was in the 1967 film Shagird, where she eggs on Joy Mukherjee (in the awesome “Duniya Pagal Hai”). 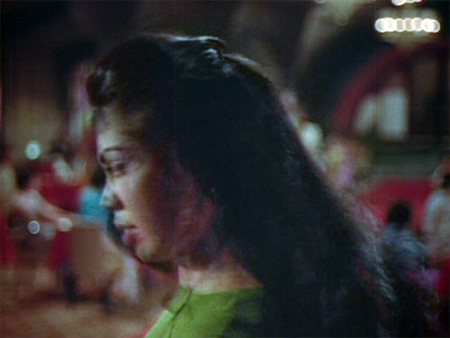 And finally, here she is in a rare solo dance, from Vazir-e-Azam (1960). She says she did several solos but can’t remember any of the film or song names! If you see her in another, be sure to let us know!! I’ve seen her dancing with everyone, it seems. I spotted her in a walk-on scene in Tu Nahin Aur Sahi with Anwar Hussain, too—he flirts with her. I guarantee that you will now see her everywhere, as I do. I can’t wait to sit down with her one day to drag more stories out of her (and to smoke a beedi with her)! Feel the love, Edwina: thanks for helping to make these songs and films so memorable, and for being the strong and hilarious and wonderful lady that you still are! Posted on February 6, 2011 at 12:28 pm in Hindi film history, Hindi movies	| RSS feed You can skip to the end and leave a reply. Memsaab, you have made my day with this wonderful celebration of Edwina! It is always a joy to spot her in a movie scene or dance number. Edwina, even if you took it all for granted at the time, please know that your work in films has made all of us very happy viewers!! Bless you! Never really felt This Important for Many Years now & Truly did not know how to Handle This Situation but I Loved & Love It All To this day I go back to The Post & Read It especially when I Am Down in the Dumps!!! You & Our Tom have been so so Good to Me & have become My Very Best Friends for Life! I feel absolutely rotten about My Ignorance in all of This & not knowing how & what to say to each & everyone of These Very Special People who made Me Feel So Special & Worthwhile & gave Me a Reason to Go On Believing in Myself Again Thank You All from the Bottom of My Heart & I Love You All As Well !!! Oh I am so glad you have commented yourself finally :) It’s not so hard, is it! Edwina, thrilled to see you commenting here yourself. ! Indeed, all of us are indebted to Greta for bringing to the fore your personality (and also so many others who have contributed so much over the years in Bollywood but have never got their due, thanks to Bollywood’s star-struck nature). Thanks SO MUCH for giving us all those wonderful moments and dances. And that absolutely lovely smile. Whether Bollywood remembers you or not, we will always cherish your performances on screen. Not just that – you are also a wonderful person off-screen. And that’s even more important!!! I wish you and your family the very best in everything!!! I remember remarking this to Greta & saying just how Intelligent You come across to Me & I am sure to Many Others I would imagine Thank You for being so Supportive Raja God Bless You & Yours Always!!! Waah waah, this post is a goldmine of information. It gives me lots and lots of material that are totally new for me and for others as well. In fact, I do not think all this information was available anywhere else on internet till now. I hope you’ve asked them!! I’d love to read that book, especially if it’s been written by you. Thank you for this post – loved every bit of it, and realised how many places I’ve seen Edwina. In some of my favourite songs too. She’s also there in Ajeeb dastaan hai yeh. No dancing, of course, but she’s there. She is, sitting right behind Raaj Kumar and Nadira :) I think Edwina would let me write whatever I want (well, as long as it’s not a pack of lies) but Ted is a little more reticent ;-) We’ll see! Lovely, lovely, lovely, lovely, lovely!!!!! Not just the post but also the subject. I’ve seen Edwina in many movies – in fact, whenever there is a dance scene or even a “saheli” scene of the 60s, I am always looking out for her! Feels really good to spot her. Just like it feels really good to spot Ted. You are absolutely right about her looks – they are stand-out looks. And a radiant smile too. No wonder she was getting more and more roles as her career went on. I think the Ted/Edwina family (with all its extended elements) is one hell of a family. Not only extremely talented (they seem to be naturals for music and dance) but also knowing how to live it up. Lovely post too, Greta. I can REALLY feel the love. And Edwina, if you are reading this (I hope you are), thank you very much for what you’ve done in Hindi movies, we love you and wish you a lot of good health and happiness! I do really love her, she is a kindred spirit. Ted too, and their families. Just good people with a lovely colorful past! Yes she is everywhere, that song list is enough to convince me. Thank you Edwina for being everywhere. What an introduction! Awesome. I hope she’ll post here…that would totally make my day. I hope so too, it would be fun if she’ll say hello :) She’s traveling right now so it may be a while, but I am sure she will at least read the comments and enjoy them! Thanks; I haven’t really seen Edwina before but I’ll be sure to look out for her now. Helga is your friend Ava’s Mother? Have you covered this before — I probably missed it. I think I have mentioned it before (Ava comments here too sometimes)…she only ever did this one appearance though, I think. Thank you for introducing all of us to the delightful Edwina, Memsaab. Please do convince Edwina and Ted to let you write that book! I will do what I can. I need a grant so I can go and visit them and pester them for days on end in person, ha ha! And you say you know so little about Bollywood. I am yet to meet someone who’s given us so much information about anything in Bollywood. I do love the obscure and the unfairly unsung, for sure! Sets me thinking, is there anything in Bollywood that you do NOT like? Just wondering if anyone can confirm that Helga also sang the song “Aage bhi jaane na doon” in Waqt. If you read memsaab’s review of “Waqt”, you can read it there that the lady singing that song was Erica Lal. You know, my friends were convinced that Aage bhi was sung by my mom, and spread the word. I told them it wasn’t but they just went on with that story nevertheless. Thanks squarecutatul. Sorted it out for me. Not Jealous eh? I believe that hah! What a lovely career she had in films, doing so many dances, spreading happiness. I told Tom, I remember, that Tu Nahin Aur Sahi was so enlivened by the frequent dances by various girls. I must must must must watch O Haseena again, I remember a girl shaking her hair all over the place at the start. Lovely Edwina! May she live long. Ha ha, even I don’t believe it. I AM SO JEALOUS. Actually, I used to want to be Helen in my next life but I think I’d rather be Edwina (or Teresa, who married Oscar BTW, making me pretty envious of her too! )…sounds like they were very carefree and had a lot of fun. Edwina is a great spirit, there is no doubt about it. Gosh me too. I so wish I had married into this family. thank you for introducing us to Edwina. So many faces and artistes unknown. BTW I always wondered what happened to Raj kiran, the guy who starred in Arth, Hip Hip Hurray and Karz. I think there is a whole comment section about him on my Karz post or somewhere here…I have not seen him in much, although I remember that he went on a bit of a downward spiral due to excessive drinking or something (read that in an old magazine, although the magazine article was about his fall from grace and then his climb back up INTO grace, so not sure what happened after that). Now this news is splashed across all the news channels. Thank you for this post. It is very gracious of you to share, and in such a pleasant and informative way too! Wonderful post, as usual Memsaab. I would like U to write a book on every such celebrities you are in direct contact with, including their own reminiscences as Edwina’s about M. Sinha here. That would revive their own memories and educate the modern Bolly fans about their contributions to the Hindi movies. Through people like Edwina, the item-number genre became popular and is still a hit in every movie industry in India. I agree that Edwina is quite attractive. 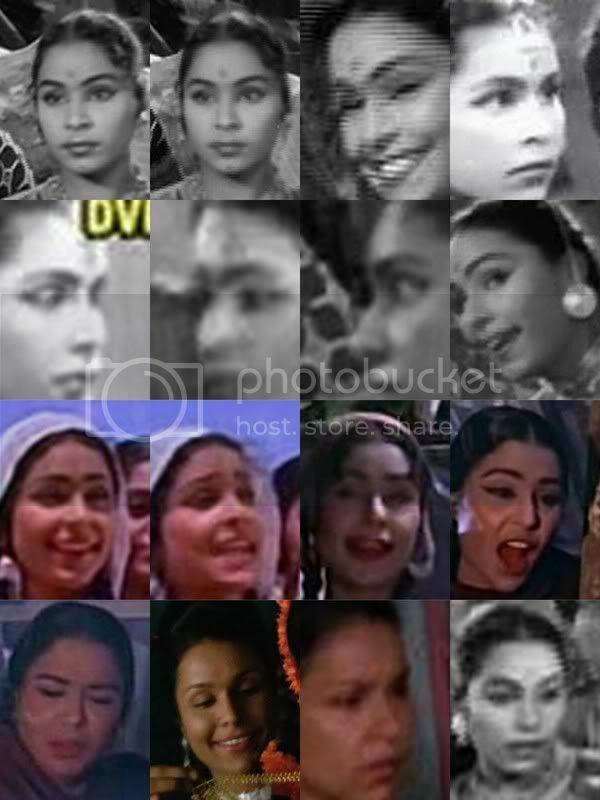 I saw her first in Arzoo but could not identify her in the “Oh Haseena” song: will see TEESRI MANZIL again. But as for Ted, can U point him out in the Junglee song, or any other song where his face had been shown distinctly? Would be kind of U. As for your jealousy about her, I would say that am grateful that God has not exchanged your lives; otherwise U would have spent all your energy dancing on-screen, and we would have been deprived of these bewitching reviews. So keep on writing Memsaab, and provide these mesmerizing colorful brushstrokes in our drab B/W lives. Wishing U a lovely Spring, and waiting for your next review eagerly. This post made my day!!! I love reading and learning about the many, many people who go into making a film and I agree 100% that these films wouldn’t be the same without the background dancers and junior artistes! Ava’s Mom Helga, did you say in this post ? Did you mention her in any previous post that I may have missed out. Or may be you should do a post on her as well for the benefit of less knowledgeable ones like me. I don’t think she did very much, the appearance in TGKS was sort of a one-off. In any case, Ava would be better suited to writing about her than I! Atul, My mom worked in just two movies, Tere Ghar Ke Samne and a short bit in Kaise Kahoon. She does not like saying anything about that time, so I am woefully short of material. 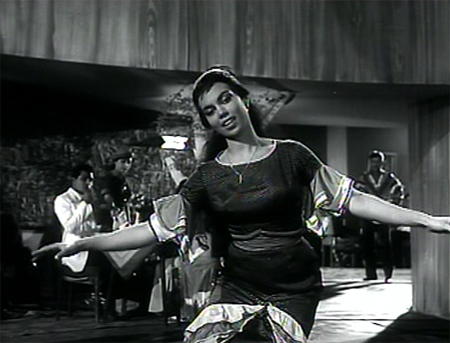 So that’s Edwina “cajoling” Shammi into singing and dancing at the start of “aaja aaja” in Teesri Manzil! I’ve been dying to know who she was for YEARS. Edwina is indeed a striking woman and she really is everywhere or at least everywhere worth being. Thanks for the intro…I’ll be looking for her in the movies of the 60s with same glee as I would a dear friend. Thanks for the information. In the pic with Tuntun (the 3rd one )Edwina resembles Michael Jackson to me. You might need to see an eye specialist…. Thanks Memsaab. This post is a treasure tove of information. I’m sure it involved a lot of painstaking research. Now that we know all this about Edwina, it would make the songs and the movies in which she featured that much more enjoyable. Fabulous! Thanks so much. Next time you speak to Edwina, I’d love to know about the costumes and costumers in these films…did the “junior artistes” wear their own clothes, as was common for extras in classic Hollywood movies? Gosh! I am Gob Smacked!!! Really do not know what to say to You & to all those lovely people who commented & have made Me feel like a Million Dollar Babe I now feel it hard to fall asleep with such a Swollen Head as well My Head feels that it does not belong to me either Wow!!!!!!!!!!!! Completely lost for words so can You please say ‘Thank You’ from the bottom of My Heart to each & everyone who contributed to this eh! Wish I could turn the clock back & do this all over again See what You all have done to Me!!! I haven’t watched it yet but I am sure it will be :) Probably Edwina is on there a lot too! Ava, a pity that your mum doesn’t talk about that period. I would have very much liked to use her memories for my book. I got a query from someone who was doing research on Navketan, I forwarded his questions to my mum, but she did not respond. This is a good one for seeing Edwina, she is wearing the polka-dotted dress. Beautiful! They never really got any credit, just showed up and worked and moved along. But I think they are a very special lot, and many of them very striking and graceful to watch—much more so than some of the heroes/heroines who got all the attention. You are SO right about that last line! I used to see them sometimes, just waking up from their sleep when I went to lunch during school recess at my aunt’s place. They seemed so glamorous, these creatures who danced all night, and slept late, after they came back from shootings. I’d love to meet Edwina some day. Lucky you, what lovely friends you have. I am not jealous, not! I will take you to meet Edwina! She is going to introduce me to Oscar and Teresa too, so you can be there to pick me up when I faint from joy :) Funny how the thought of meeting Pompadour Man thrills me more than meeting many much more famous people! :) You just have to write that book. Oscar, Oscar, Oscar! You’re going to meet the Pompadour Man!!! Please don’t forget to ask what it was like dancing with Helen. :) He must have appeared with her in at least 50 films (Geeta Mera Naam, Jaane-Anjaane, Preetam, Hum Tum Aur Woh etc.) ! Isn’t this Edwina in this clip? The print is pretty bad but it does look very much like her. Suhag Sindoor (1961). Rather late with my comment, but wanted to go through this post at leisure, very interesting and very informative. I suggest you write a book on such dancers and actors whose names we may not know but whom we have seen in countless films. Yes that book is going around in my brain, although finding the time to do it is another story altogether! :) If only I would win that lottery! Best of Luck for the lottery, now all you have to do is by the ticket! HA! HA! Is she here too in this song? Looks like her! Great research memsaab and truly a labour of love. I am a bit jealous about Edwina. No, not for her appearances in the Bollywood songs. But that she has such a lovely and true and dedicated friend as yourself! Please accept my congratulations for the original article on Edwina well written and well-documented. I also take this opportunity to wish Edwina and her family and friends the very best in life! The Byculla girl had many admirers and still have so many of them till today. Indeed she is one of a kind :) I am envious that you knew her way back when! Good find, Sidarth. Yes, she’s the tallest dancer and with the longest hair. Memsaab it is a really wonderfull post. Those were wonderful years till early 60s. Whenever I watch and listen to these melodies I wonder how sweet and melodeous songs were. Also people like Edwina and Ted were(are) down to earth compared to todays lot. Also when songs were picuturized on streets and country side how less populated were streets and how nice country sides were. May I request you to mention some anecdotes about shootings at that location or studio? May I ask you to a humble question? Have you wriiten or planning to write any book on Indian Cinemas of 50s or 60s? Thank you so much memsaab for such a great introduction! I had seen her in so many songs and movies but never knew who she was. Now that I do, I hope I get to see more of her. What a musical family! And all those films that they have worked in wouldn’t have been the same without their contribution. Love them for all the good work they have done. How are you? This is Mangal, (Begums daughter) I hope you remember me! Every time we see, the old songs, i show my kids all of you. pls write to me on my email! My very objective opinion indeed. Thank You Mallu for Your Love & Sweet Words & I am so fortunate that through Greta that this all came about in the First Place If it was not for Her & another Very Good Friend now Tom who made all this possible that I also had the Pleasure of Viewing them & with Everyone else that commented in this Post that helped to make Me feel like a ‘Queen’ I would never have known any different As You know I was never aware & never thought of Myself as being a Star of any kind but just an Ordinary Nobody in the Film Line along with Your Mother Pam & all Our other Dancer Friends in Our Special Group going out there to the Studios to earn a Crust like any Normal Person going to work doing a 9 to 5 job elsewhere in an Office or Factory or wherever until this happened Now I Feel We were the Lucky Ones & the Credit should go to all Our Girls & Boys of Yester Years who all contributed to the Film Industry to make it Complete & not just the Heros & Heroines Not only of the Past but also of the Present & the Future They make it all look so easy but it was Very Hard Labour indeed !!! OMG, THE Edwina! Great to hear from you! What was it like on the sets? Have you met the Moolchand!! :) What’s he like? There’s a dancer named Harbans right? Is the girl who sells flowers in Kashmiri Ki Kali and Junglee, plays second girl in Chanchal’s group and generally dances in a lot of scenes named Hameeda? No, you don’t know me. I’m just a Bollywood fan who visits Memsaab’s blog. I’ve seen you in a lot of films and I applaud your great dancing skills! 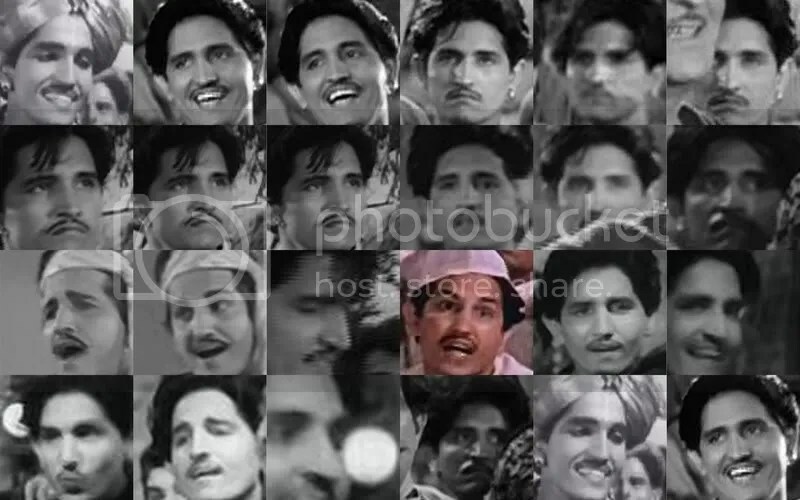 Moolchand is the really fat guy with a cute voice who appeared in almost every Hindi movie made between 1951-1981. You may have crossed paths with him in Junglee, Naughty Boy, Waqt, etc. A few questions if that’s okay. How do you get to be in the dancing sequences? Do you have to audition for the roles or can any actor appear as long as they can dance? Do you have dance training? Did you improvise or did the dance directors like Surya Kumar, Satyanarayan, Suresh Bhatt, etc. fully choreograph those scenes? Once Your In & become well known to the Dance Directors then the rest is easy The Choreographers are the Main Ones who select the Dancers suitable for the Dance in Question be it Indian or Western Then they set Their Dance Sequence on Their Assistant who in turn show the Dancers the steps in the Rehersal Hall for a Day or Two if it is to be a Big Dance Sequence otherwise if plain & simple with no necessary Formation on the Set itself The Dancers were truly so Good in Picking up the Steps that there never really was a Problem which made Everybody else’s Life Easier If ever there was a retake taken it was more to do with the Artist getting things wrong rather than the Dancers who lit up the Set!!! My print is ye olde VCD rip so pardon me if I am mistaken. Thank You Ashwin & where do You live? In India? The Other Girl is Teresa also a Good Friend of Mine to this Day If it was not for Memsaab I too would never have had the Joy of watching all these Oldies of Yester Years My Family & I have been having the Time of Our Lives reminiscing Those Happy Times!!! Keep well & keep Happy wherever You are & Bless You! But I must add yu and all the dancers of cha cha cha, rock n roll, ramba samba had a big fan following in Kenya also, unfort we could never see the credits to your name, so what Memsaab has done by bringing all the folks other the main actors to the limelight is a something extra ordinary. Without this platform we would have not known even their names !!! And pardon me Edwina, mixed yu with Teresa, I can see the difference now as I just updated Memsaabs AIG, another wonderful feature, kudos Greta for this. Thanks again Ashwin I do phone Teresa(who never left India) from time to time & I have tried to explain all that has been happening but to Her it all sounds ‘Gibberish’ & finds it hard to understand! Oh! You are so Sweet Ashwin! I believe it is not AIG but AIP I was told I did not like the Picture of Me there so I requested My Dear Greta to change it & she did to an even Younger Looking One (1960) which put a Smile back on My Face Got Friends in High Places ha!ha! I am 69 but in a few more days I will be the Big 70 & it has not Hit Me yet I think Young though & Feel Young at Heart which does help eh! Glad You are Proud of Yourself & so You should! Thanks for getting back & God Bless You Cheers back to You too Bye for now! But now Mr. Jinx says it’s not Honey but someone named Jennifer, who I don’t know. 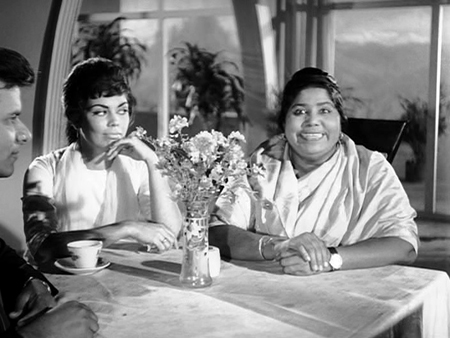 The more I learn about these people the more I come to realize the importance of the Anglo-Indians both in front of and behind the camera in these classic Indian films. Jennifer seems correct. Her name is in the credits. 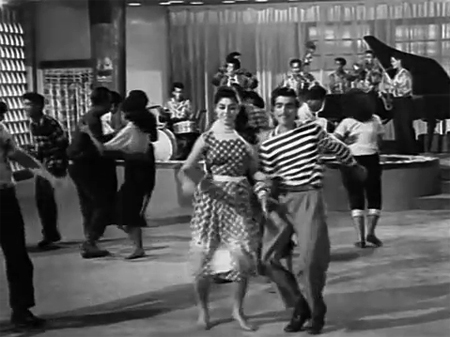 b)In 60s hindi film, how long did it take to teach actors/actresses a dance? I would be eternally grateful if someone on hear could help me out because I’ve wanted to know the answers to these questions for years! Second Question is that it all Really Depended on the Individual Actresses/Dancers like Vyjantimala Padmini- Helen- Kumkum who were Natural Dancers no Time at all! Actors like Pradeep Kumar- Pran-Rajendra Kumar almost Forever! Yet Mehmood-Shammi & Raj Kapoor was no Trouble as Mehmood & Shammi made up Their Own Steps Anyway & Ignored the Choreographers They were Great Fun though!!! LOL!!!! I love this kind of info, thanks Edwina :))) I’ll bet the dancing was agony for Pradeep-Pran-Rajendra, as it would be for me! Do not Underestimate Yourself Greta (Memsaab) You have more Talents than Most People would Wish for & I am sure Put to the Test will Surprise Us All Including Yourself Perhaps!!! You are One Very Clever Individual but Very Modest with It Love You for it!!! Sorry Vinia I used the word Dubbing when I think I should have said Miming to the Recording of Songs by Our Professional Singers of the Film Industry I was in that Line of Dancers only until the Year 1967 Unfortunately! Best Years of My Life!!! Wow! Such quick replies! Thankyou Edwina, Memsaab & Sidharthbhatia! Now I can sleep soundly at night! I am in the UK too, London – would kill to be back in India :( I too had always thought that it would be awfully hard to shoot with the background noise of the passer by’s so this has really amazed me! I can not thankyou enough! To all the blog family members here, I read this blog after quite sometime and just now realised that Edwina was a former Bollywood character artiste. I recall seeing Edwina in so many movies. Good to know she is well and lives in UK. i think she danced well. Edwina – how you must be feeling now – i can imagine;;;… leaving Byculla in 1967 and again coming in contact with fellow indians about your career after 1967. Did you never miss Mumbai or Bollywood glare ? You must not have felt that because as per your own admission you never gave much importance to it and thought of your stint in Bollywood as a 9 to 5 job. bollywood has changed a lot since you left madam. I don’t think the work done by creator of this blog spot can be replicated by anyone else – not in the near future. Edwina, I hope you agree with me that the work carried out by Greta is mind blowing.She has brought all the unsung talent in Bollywood and has given them recognition. The reason her blog is popular because she herself comments and also provides little tid bits of info that are never available elsewhere. Thanks to Edwina I am updating my Galleries with some of the other dancers and musicians that you can see everywhere in films from the late fifties into the seventies :) But there is still a whole BUNCH of unsung talent to dig out! Oh! Kunal I only just returnd from Visiting Greta in Boston USA Yesterday after a whole month with Her & Her 2 Doggies named Callie & Gilda & have not got over My Jet Lag yet & also the time difference between there & the UK Yes Our Greta is the Greatest & I am already Missing Her! Yes She is very Unique & I Love Her so & so do many many others I do not miss My Mother India because I visit Her twice a Year as I have My Home in Naigaon (West) Thane District too How can anyone forget their Roots is beyond Me eh? And trust me, Edwina IS still very young at heart and she can still dance too! Thank You both Swarint & Memsaab Aap jhoot nahi bole! Aikdam Sai ! Excuse My Hindi spelling! They are quite a Family those 3 together!!! Ah, so that’s her name! I didn’t know that all of the members of the Ted Lyon crew were related – now I see the resemblance! How lucky Edwina is to have been such a huge part of one of the most amazing & magical troupes of dancers that the Hindi screen has ever seen – priceless memories! Yesterday (ie May 1, 2013) spent a lovely Day with Edwina Ji here in Mumbai…. she is so humble kind lively and the best person i have ever met…… she is so sweet… i dont hav words to express my love and thnx to her… GOD BLESS HER………. You know like others.. i too used to notice her in films since my childhood…. she did work only till 1967 or so , but amongst other she was the only1 i used to notice and remember…. and by destiny i finally met her… also to mention that she born and brought up in the area of Mumbai where i stay (im proud haan!) :)…… all the things are so cute… spent a day with her along with Baba benjamin (the man who danced with Helen in ‘Karvan” (aaj ki raat koi aane ko hai …. OR in the song “aao huzoor tumko sitaaron mein le chale” holding Babita or dancing with Madhubala in Kal Hamara hai) and watching all those 60s songs in which they danced and were with US… its still a dream.. so heavenly……………………..
My second post. Again, doffing my hat to the constant stream of gems you have lined up in your blog (Edwina is a very brightly shining one). I just notices some striking resemblance between Asif Mandvi and the guy in the second pair (amongst the last left standing). Are they related by any chance ? Oops – posted before I had completed. No Edit button :( I was referring to Cha Cha Cha snippet. Noticed some striking resemblance between one of the guys (couple is prominently featured throughout, and one of the other couples left standing till the end with Edwina and partner) and Asif Mandvi. I know that this post is very old (read it a few years ago). 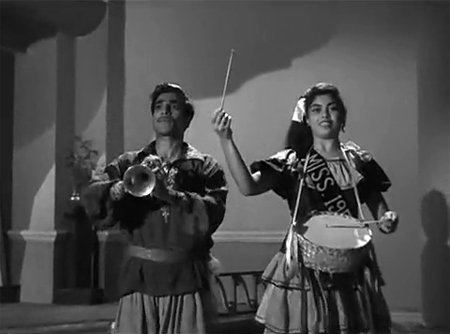 I was wondering if anyone can guess the actress in the film “दिल्ली का ठग”, dancing and singing “ये बहार ये समा”. The face looks familiar but she is not Edwina.The movie (दिल्ली का ठग) came out in 1958, just about the time Edwina started appearing in films.